Thank you for your continuous patronage with LSI Sapporo Clinic HP. 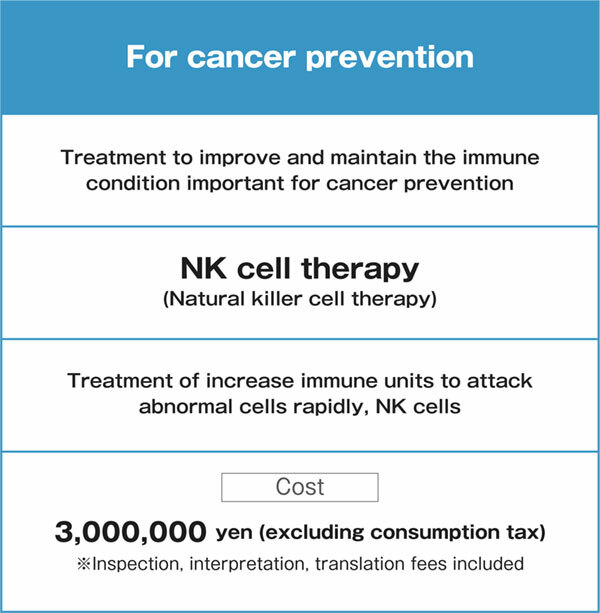 With the cooperation of Medical Tourism Japan Co., Ltd., we will start a course for foreign patients with the purpose of cancer prevention, treatment and testing. The human body is composed of about 37 trillion * cells. Cells divide and proliferate daily within our body, creating new cells and keeping the body healthy. However, in the process of cell division, copy errors (mutation of genes) are caused, resulting in abnormal cells that become the basis of cancer. Thousands of abnormal cells arise per day in the body of healthy people. 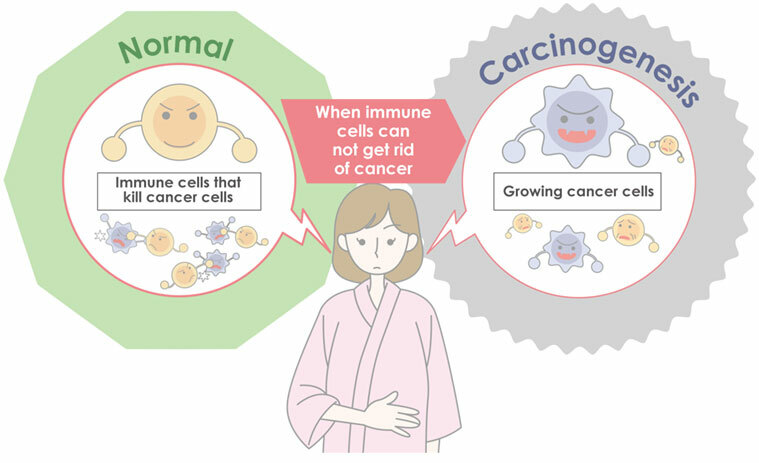 In addition, it is thought that carcinogenesis is caused by changes in genes due to aging, changes in hormonal balance with aging, living environment (stress), accumulation of environmental factors (carcinogens), and infections caused by immune depression. Recent studies have shown that “immune cells monitor the body and get rid of abnormal cells”. However, abnormal cells that arise in the body can undermine the monitoring function of immune cells and cause cancer as they divide and proliferate. Particularly with age, the frequency of reproduction error increases with the degree of cell division, and immune cells decrease with age. In other words, the probability of developing cancer increases with age. The size at which cancer can be confirmed with the naked eye is said to be from “1 cm” (100 million pieces). 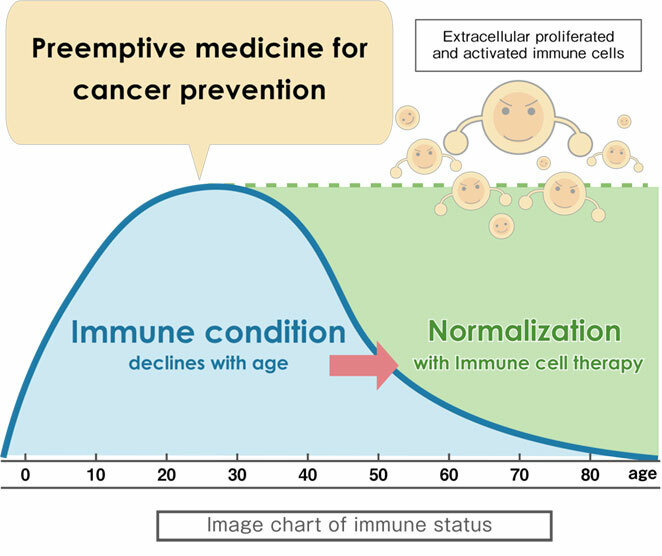 With age, the risk of developing cancer rises with “increased frequency of cell copying error, decreased immune status, hormonal changes, etc.” The “immune cell therapy” we offer is a treatment that can maintain a normal immune system and reduce the risk of developing cancer. There are several methods to improve the immune condition, however immune cell therapy is a method to directly improve the immune condition by “proliferating and activating immune cells outside the body”. It is provided as preemptive medical research aimed at cancer prevention. 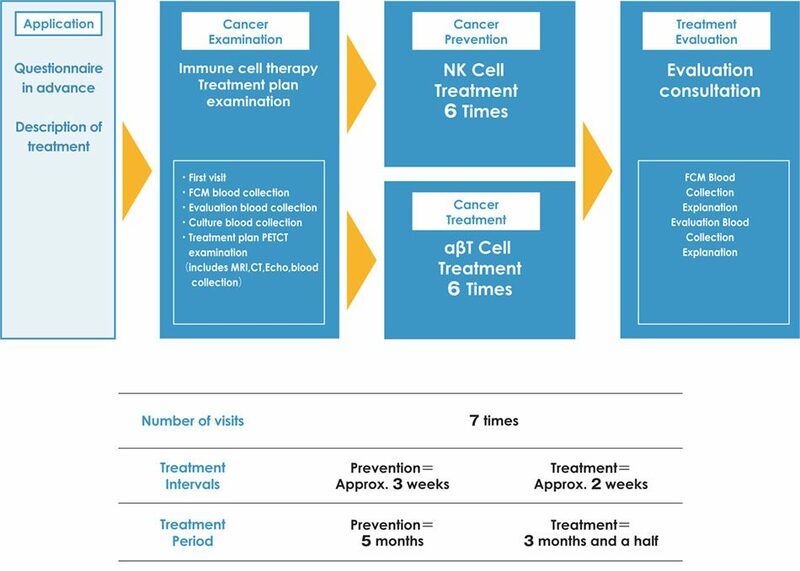 Cancer immune cell therapy is a treatment that attacks cancer systemically, by re-administering into the body your own immune cells extracted from the body which has been cultured and strengthened. The advantage of using your own cells is that they can attack systemically without worrying about side effects such as impaired immune function. 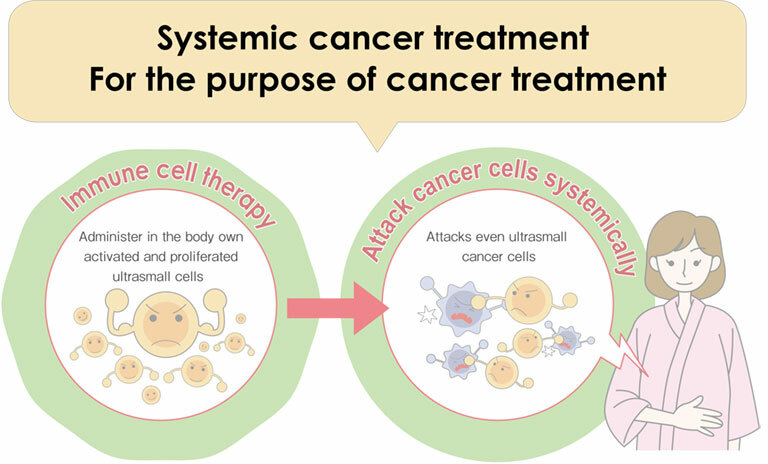 In particular, it is a treatment that can be expected to be an adjuvant after surgery (post-operative assistance) as it also attacks the ultrasmall cancer cells that cause recurrence. 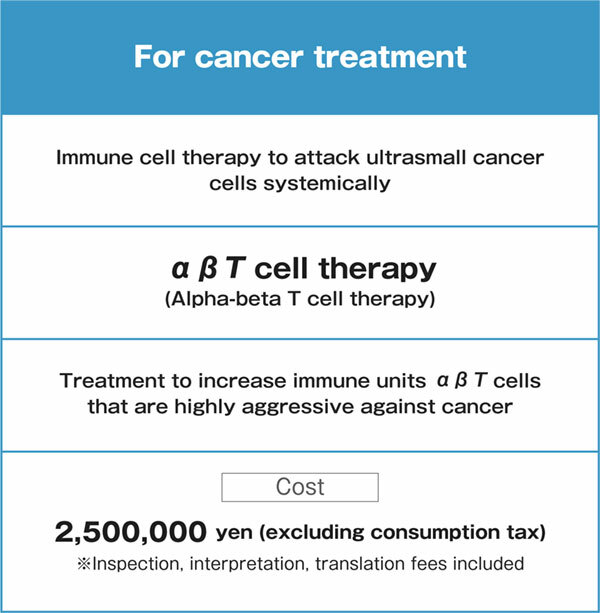 In addition, it can be used in combination with other cancer treatment such as currently used anticancer agents and radiation treatment. Many cancers are characterized by consumption of more than three times as much glucose as normal tissue. Therefore, when a glucose-like test drug (FDG) is injected intravenously, a large amount of FDG gathers in the cancer lesion. This FDG is labeled to emit radiation that can be detected by a PET device, so scanning can detect cancerous lesions from outside the body. Also, CT images taken at the same time show exactly where in the cancer is located in the organ. In order to detect cancer early, it is necessary to combine various examinations strategically, but we are working on early detection of cancer using the latest technology focusing on this PET/CT device. 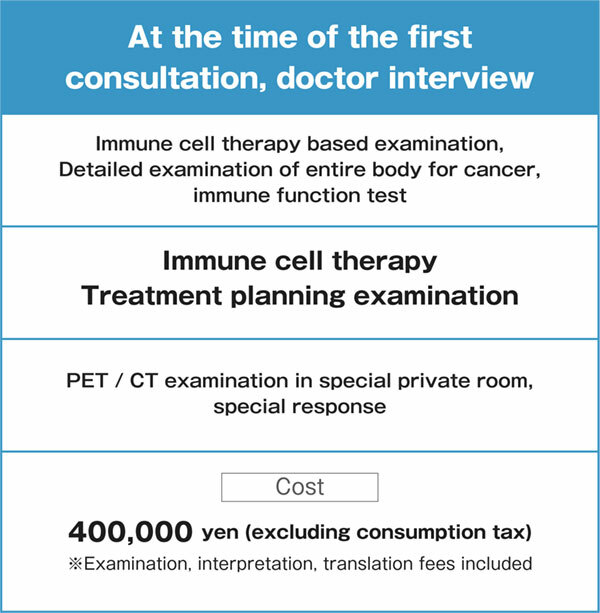 In addition, it is possible to conduct special examinations in a special private room. After treatment, “light fever, rash, malaise” may occur very rarely, but other than that, no serious side effects have been observed. Considered to be a treatment that places minimum burden on the body. Also, one case has been reported for a patient over 70 years of age, where alpha-beta T cell therapy may have elicited autoimmune disease. Improves immune status to prevent cancer and provides preemptive care that reduces the risk of developing cancer. Cancer is known to develop when immune cells cannot get rid of viruses and abnormal cells that are the root cause of the disease. However, immune cell therapy is not a treatment the absolutely prevents cancer by improving and maintaining the immune status. ・If you have a history of interstitial pneumonia or its symptoms. ・ Received an organ transplant or allogeneic bone marrow transplant. ・ Positive for either HIV antibody or HTLV-1 antibody. ・Females that are pregnant, may be pregnant, or breast feeding.